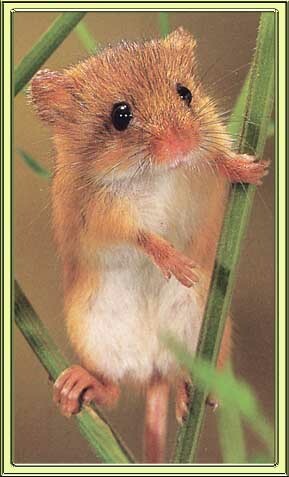 One of Britain's smallest animals is the harvest mouse of the Family Muridae at 2.5 inches long. 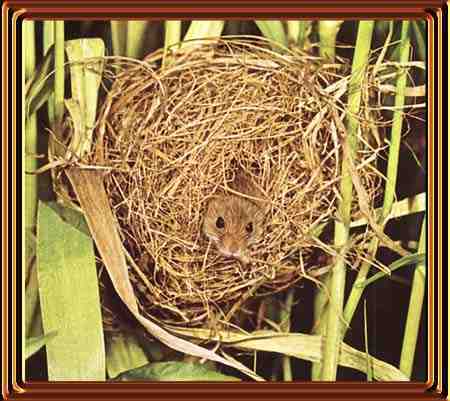 It lives mainly in the south east of Britain in cornfields, surrounding hedgerows, dykes, reed beds, long grass and allotments near towns and villages. It moves gracefully from stalk to stalk aided by it's tail which can coil around anything (prehensile), giving extra support to the mouse and acting as a fifth limb. Size: It measures in at 2.5 inches, the only mammal smaller in this country is the pygmy shrew (Sorex minutus) which measures in at 2 inches. Weight: This little fellow weighs in at 5 grams that equates to one fifth of an ounce...! Breeding: Right through from April to September. No /litter: This young lady produces between 5 - 9 young per litter.